Marked improvement can result from lifting the forehead to rejuvenate the tired appearing face, while relaxing the thick muscles to soften the stern or angry frown lines. 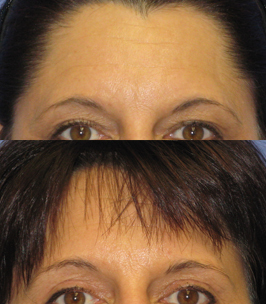 A browlift may be done independently or in conjunction with another facial procedure such as a facelift or eyelid surgery to achieve the desired look. There are a number of techniques to smooth the forehead and elevate the brow. Practitioners always tout the technique they use as being the “best” but more likely the procedure some view as “the best” is primarily the operation they are more comfortable with. Surgeon’s comfort should not triumph patient results in browlifting or any procedure where the results of the two procedures are different.